After setting the profile, every time you log in Twproject shows you the current user home page. Twproject has several built-in home pages, customizable for different user needs. Setup creates some useful sample “dashboards” that reflect common use cases, we’ll see them in detail in the following. In order to have an idea about how Twproject can help organizing work’s activity, let’s see an operative page. The “Get things done” page is designed for people that use Twproject as support for their activities. 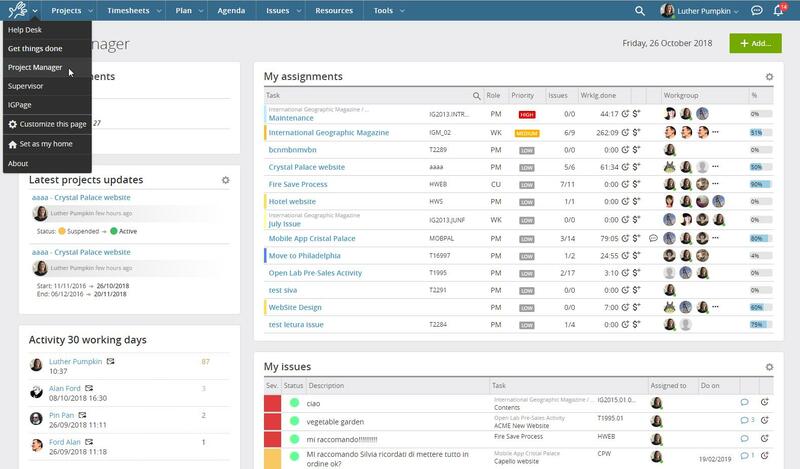 With just a look you will see what you are working on (“my open projects”), your issues, agenda, to-do’s, your most used entities. On the bottom part there is a time-bar where your will see the current time (red vertical line), appointments (green blocks) and milestones (diamonds, if any). Most of the “boxes” have additional features accessible by clicking on the filter buttons. For details about each “box” (aka widgets) see “Widgets” section. You can choose your preferred page and set it as default by opening the home menu and pick “set as my home”. You can also customize all these pages, but for a beginner it’s wiser to wait a bit, and get to know Twproject; if you remove a crucial part just for testing, you may lose sight of relevant data. This page contains in particular the “project summary” widget, which is a quite powerful summary of open tasks that are almost done or so should be. But don’t be mislead: these ready widgets do just a fraction of the custom data filtering that you will be able to do when you’ll have learned about task filters (see “Search with Twproject” section). This is a page with simplified functionality: it basically lets you simply create new issues, which then the project managers may distribute to operators if needed, raise to a second level help etc. .
Every Twproject’ user by default can customize her/his home page/dashboard. A page is composed by a template (a sort of grid) where widgets can be dragged. At the top of the page you will find a list of widgets that you can drag into your page in the box you prefer. Drag to move, click “x” to remove. The list of widgets is complete, you will be able to change your dashboard according to your way of work. A widget for adding issues easily is available, one for keeping track of task status is available too and many others. Boxes can be blocked by the administrator with common widgets for all users. For the administrators: administrators will have a double option: they can change their own page or the “default view” for other operators.